Are DUNS numbers the crack cocaine of ID systems (and is the UK the latest addict)? They could also have added that they are highly unsuitable for the open government world which the US, the UK and over 50 over governments have signed up to, or that DUNS numbers do not map to legal entities (for example, every Walmart store has one), or that it requires governments to buy their own data back from D&B with very little value added. Together with the lack of provenance, this makes the system a Black Box of questionable quality, as the government is essentially reduced to taking the entire system (what the DUNS numbers represent, and how they are related) on trust, as a dumb consumer. Unfortunately, the Federal Government and indeed US government at all levels have integrated the DUNS number at such a deep systematic level that it’s now genuinely difficult to wean itself off them. In short, the Federal Government is addicted to the DUNS system, and like an addict that’s been on the crack for years, it’s going to be a tough, hard, long road to wean it off it. However, it’s not only possible (and the DATA Act offers a possible route out), the alternative is much worse, because every year that it continues on the drug, it becomes more and more dependent, and moves further away from being a functioning member of the open society. In many respects the US government’s reliance on DUNS numbers is understandable. When they were introduced in 1962, they probably seemed like a great solution to the government – hey, kids, try this; it’s fun, and will make all your problems go away. There is also the fact that in the US, legal entities are created by the individual States, not the Federal government, meaning that until OpenCorporates came along with an IP-free ID system it was difficult to find a common way of identifying them. The UK government, however, has no such excuse. Not only does is it not some naive youngster, unaware of the problems, just trying it out ‘to see what it’s like‘, it also has a well-functioning system of national legal identifiers, created by its very only Companies House. In fact, in the Prime Minister’s letter to Cabinet Ministers in July last year, in November last year, he wrote “Unique reference indicators [URIs] to be introduced by DBIS and HMRC beginning in December 2011. These will enable the public to track more easily the interaction between companies and government bodies“. And in fact in October, one month ahead of schedule, Companies House indeed published URIs for companies (disclosure: OpenCorporates was involved in the discussions about these identifiers, and advised on their construction). In the blog post reporting on those URIs, we asked whether the government would actually use these identifiers (perhaps even using OpenCorporates’ reconciliation service to match the suppliers to the entities), or would it use the DUNS numbering system that was at that point just in limited use in the government? There’s the DUNS Number, right at the top. But how does this enable “the public to track more easily the interaction between companies and government bodies“. This doesn’t help us identify which company Adept Recruitment is (by the way it’s this one), or what type of company it is, and because of the proprietary nature of the DUNS number we can’t even use to to tie other data together. 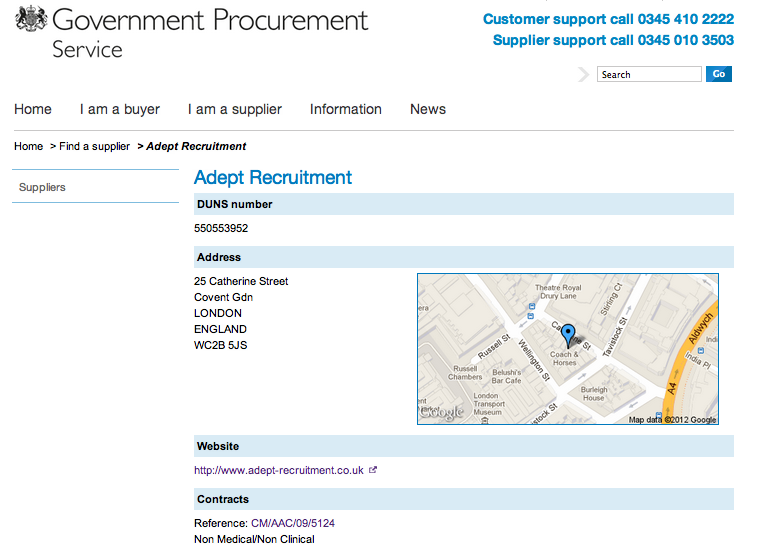 But more than that, it means the Government Procurement Service probably doesn’t have that information, either. All it has is the DUNS number, and so if it needs anything more (the current status at Companies House, its credit rating, etc), instead of getting that for zero cost (in the case of Companies House) or very low cost (from any one of a number of suppliers), it has to go through Dun & Bradstreet, and pay its mark-up, which can be frankly whatever it wants. So, was this a typical case of the government’s left hand not knowing what the right hand was doing? Perhaps, although we were warning senior people in the Cabinet Office (which is responsible for both the Government Procurement Service and the government’s Open Data program) back in November that the existing limited use of DUNS numbers was problematic, never mind further integration. In addition the Prime Minister’s letter and subsequent roll-out of Companies House URIs was pretty clear, and at the very least this would appear to be something the Public Accounts Committee and the National Audit Office should investigate. Either way, the UK government is well on its way to becoming a full-fledged DUNS number addict, undermining its own open-data policies and leaving future governments with the pain and cost of getting clean. I think the next step is with the government (to explain their thinking) or with the Public Accounts Committee. Perhaps if a few citizens wrote to them they would investigate and get to the bottom of this.